Over at Zeitsprung.fm, the podcast I produce together with partner in crime Daniel, I recently told the story of Voltaire, star of the French enlightenment, and how he won the lottery. It's an interesting story, not least because he didn't exactly win it, he actually hacked it (with the help of Mathematician wunderkind La Condamine). If you know German, do have a listen. If you don't, you can read all about it in this article by British Professor of French, Roger Pearson. Which leads me to the book I've come here to recommend, as it's written by said Professor Pearson. 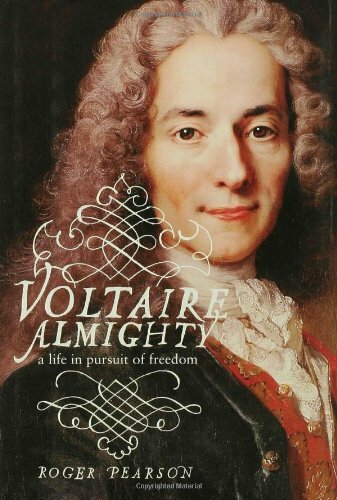 "Voltaire Almighty - a Life in Pursuit of Freedom" is Pearson's biography of the man, and what a biography it is. Clocking in at roughly 400 pages, Pearson's style brings to life not only the bard and philosopher François-Marie Arouet, who would later change his name to Voltaire for reasons that aren't absolutely clear (Pearson touches upon the various theories in the book), but he also brings to life 18th century France. Starting, literally, in the gutter, the putrid streets of Paris at the time, them moving up to the lives of the bourgoise Arouet family to the courts of the rich, famous and most of all aristocratic, places which Voltaire would be a guest at until the end of his adventurous life. If you've ever wondered whether there's the one, definite Voltaire biography you should read - as one does - then I'd say you won't go wrong with this one. Granted, I haven't read many others - in fact, I've read only this one - but I can't imagine a biography more enthralling, informative and eminently readable than this one. Do yourself a favour, buy it or get it from your local, well-stocked library. In case you're wondering: this "Book of the month" thing is a new, regular feature in which I will - unsurprisingly - extol the virtues of a book, once a month (the time-frame is largely there to pressure myself into actually writing one each month).